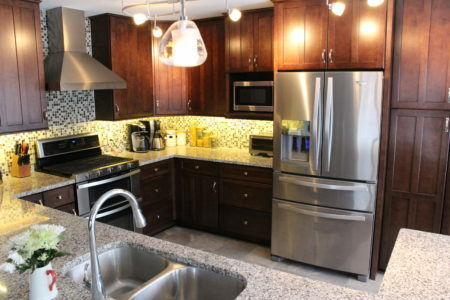 The new kitchen is ready for friends and family or for a busy family’s dinner. 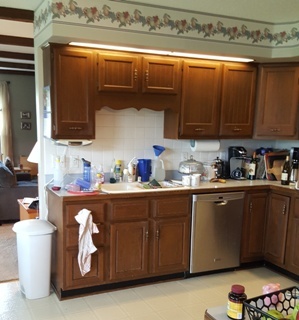 Part of a house built in the 1970s, the original kitchen space wasn’t serving this active family very well. 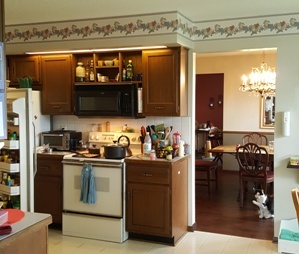 The well-used family room, while adjacent to the kitchen, was significantly separated so the cook couldn’t interact with the rest of the family. Also, the family wanted to entertain and felt that the place where their friends would congregate just didn’t have the space and flow to make for a good party. The sink wall cut the kitchen off from the family room. We reconfigured the kitchen by closing off a doorway that looked through the adjacent hallway–and into the powder room. The range now occupies the space where the opening was. A big open curved peninsula provided a nice quantity of countertop for food prep, meals, and hanging out. Cutting back part of the sink wall allowed the peninsula to open up to the family room. Traditional cabinetry dressed up the space. Removing the soffits allowed the cabinets to reach the ceiling. 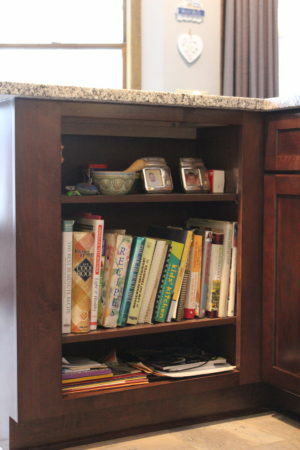 Several nice storage details were added to make the most of the cabinets: a pull-out pantry, a blind-corner base cabinet pull-out, a custom bookshelf at the end of the peninsula, and an above-counter microwave shelf. 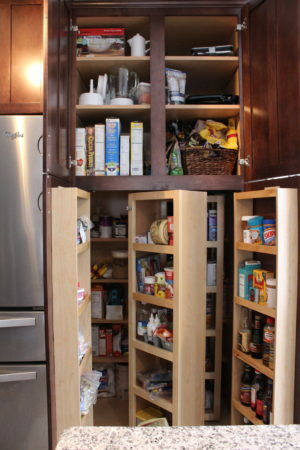 This pull-out pantry can store lots of food. 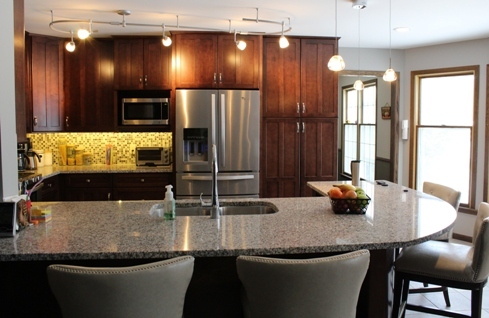 Several lighting configurations were employed to help light the kitchen: recessed fixtures, under cabinet lights, beautiful ice-cube-like pendants over the peninsula, and track lighting to enhance the cabinets and light the corners that could otherwise be dark. 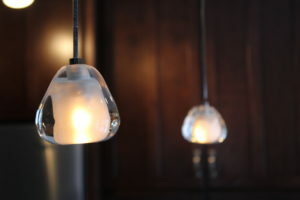 The peninsula pendants look like melting ice and can be dimmed for different lighting needs. Updates to the adjacent family room included a ceiling make-over where the dark “beams” and popcorn ceiling were removed; dark entertainment-center cabinetry was replaced with open shelving, new lighting and carpeting, and a pathway of ceramic tile where the carpet will get the most traffic. 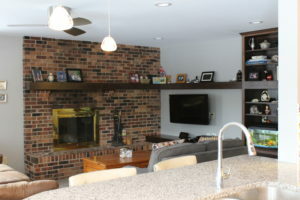 The family room has a fresher, lighter look with open shelves and bright ceiling. Now the family is ready for a party–or for a family day at home–whenever the mood strikes. You can see photos on the portfolio page.